Some time ago, I have read a very interesting and thought evoking post on the influential blog information dissemination, about the large amphibious ships (LAS) becoming the dreadnoughts of the 21. centuries maritime domain. Well read the post yourselves and decide if it is true or not. But if you ask me amphibious ships (landing ship docked, landing ship platform, landing ship helicopter ) are the only real multi purpose ships of any navy can posses. The are the naval equivalent of Swiss army knives. According to this road map in 2007, Ministry of Defence’s Undersecretariat for Defence Industries (UDI), submitted a RfP for 8 LCT’s. From the four companies that bid, ADİK shipyard was chosen. On June 2009, a contract was signed between UDI and ADİK for the production of 8 ships. The exact value of the contract was not made public but it is estimated to be around 100 million EUR. The first ship Ç-151 was launched on 2 October 2010. Her sea trials are continuing. The second ship Ç-152 was launched on March 2011. For the LST’s UDI submitted a RFP on May 2008. On 6 January 2010 again ADİK shipyard was declared as the winner of the bid. UDI is in contract negations with this company.And a contract for the construction of two new LST’s was signed between Ministry of Defence and same shipyard just last week. The ships will be delivered in 48 months. And as you read this blog the third important amphibious ship procurement project will enter into the next phase. Today was last day for companies to submit their proposals for the Landing Platform Dock. Now the evaluation of the proposals by UDI will commence. During the years the requirements of the Turkish Navy changed so that the size of the LPD has increased. It is estimated that today’s proposals will have a displacement between 25.000 to 28.000 tons range. The ship will have a landing deck big enough to accommodated 4 helicopters of 15 ton class at the same time. According to the RfP the flight deck should be able to support aircraft up to 35 tons weight. . The total personnel on board the ship’s crew plus air detachment and embarked troops is around 1000. Seven shipyards, ADIK, Çelik Tekne, Dearsan Shipyard, Desan Shipyard, Istanbul Shipyard, RMK Marine and SEDEF received the RfP in February and have been given time till today to prepare their proposals. Some of the teamed with foreign companies. 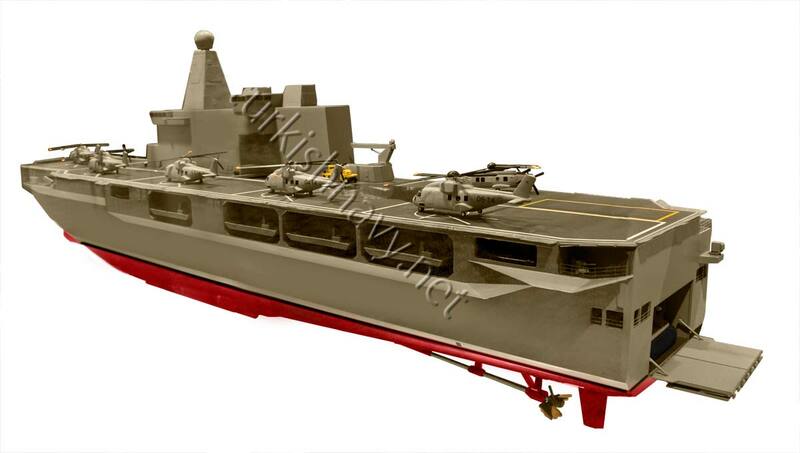 Candidates include DCNS, Damen Schelde Naval Shipbuilding, Navantia, Hanjin Heavy Industries and China State Shipbuilding Corporation are believed to be interested in cooperating with Turkish shipyards for the LPD. RMK, contrary to the expectations did not cooperated with Fincantieri for this project. In fact a reprasentitve from Fincantieri told me during IDEF that his company would not take part in the bid as their largest amphibious desing was only 20.000 tons. The RMK shipyard has developed its own design with some help from BMT. Navantia teamed with Sedef Shipyard. Their offer will be something between Juan Carlos 1 and Galicia class ships. Sedef is the first private shipyard ever to produce a ship for the Turkish Navy: A-595 TCG Yarbay Kudret Güngör. I would be a life saver for the local shipyard is they can repeat their one time hit again. The current solutions of China (Type 071) and South Korea (Dokto class) are less than 20.000 tons. As is they do not have much chance to be successful. I have no information with with Turkish yard they have teamed and how their proposal is prepared. Chinese are showing a growing interest in Turkish defence market. They are competing for the Turkish long ranges SAM system. But in order for the Chinese proposal to be successful they must incorporate Western and local subsystems which are known to Turkish Navy. As Indian naval projects showed, incorporating Western naval systems with Eastern ships can create a lot of problems and headaches and success is not always guarentted. DCNS’s Mistral has the right size and displacement but political disagreements with France makes it almost impossible for the company to bid. When commissioned this ship will be the largest ship ever operated by Turkish Navy and it will be our capital ship. The dreadnought era of Turkish Navy starts today. 1. SEDEF Gemi İnşaatı A.Ş. 3. Deniz Taşımacılığı İşletmesi A.Ş. ve DESAN Deniz İnşaatı San. A.Ş. The competition will be between the Juan Carlos, RMK/BMT design and Dokto.